We’ve already embraced mermaid-inspired hair colors and accepted mermaid fins as a poolside accessory, but a new type of Neptunian trend has descended upon us ― and it’s the closest we’ve ever come to being mermaid royalty. Bid your flower crowns adieu and behold: the mermaid crown. 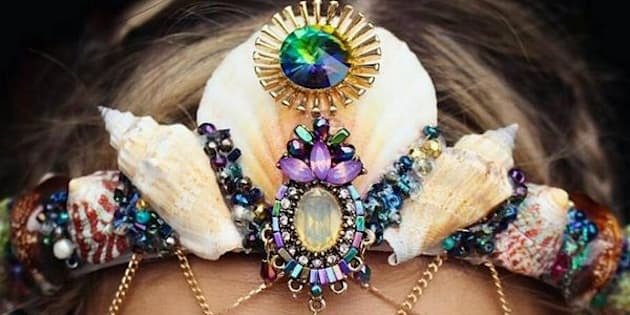 The ornate headpieces ― which social media has unofficially dubbed mermaid crowns ― are usually made of multicolored jewels, beads, chains and, of course, a variety of sea shells. And Chelsea Shiels, a 27-year-old Australian florist, has mastered the art of creating them. Although she’s been making mermaid crowns for years, Shiels didn’t start selling them on her wildly popular Etsy site (which was previously devoted to her handmade flower crowns) until the fashion world hit peak mermaid levels last year. That’s when she began posting her crowns to Instagram ― and the demand for them skyrocketed. As pretty as the crowns are, getting your hands on one isn’t easy ― they sell out on Shiels’ Etsy site extremely quickly. Of course, there are other Etsy sellers who make their own versions of mermaid crowns ― from sky-high crystal tiaras to simple shell hairpieces. Or, you can crown yourself ocean royalty with a variety of DIY videos on YouTube. If you DIY, just remember to collect sea shells responsibly. Over-harvesting shells could damage ecosystems and some marine animals make their homes from shells. If you don’t find the shells yourself, buy them from sellers who get them from sustainable sources. For a splash of nautical inspiration, feast your eyes on the whimsical, seaworthy tiaras below. #mermaid #mermaidcrowns that @syydthekiid and I whipped out today. #August starts tomorrow!